THESE ARE THE NOODLES that I made to accompany the boeuf bourguignon earlier this week. 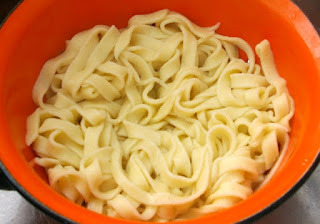 This is my own recipe: as far as I know, Julia Child never gave a recipe for fresh pasta or homemade noodles. THIS RECIPE requires a pasta maker. MIX the dry ingredients, make a well in the centre and pour in the eggs and the oil. Mix with the fingers until everything is combined, adding drops of water if necessary to make a firm but cohesive dough. Doughs made with semolina require more liquid than those made with durum flour or regular flour. TURN the dough onto a counter and knead for about 10 minutes, until smooth and silky. Semolina dough is rather stiff. NOTE: You will learn the feel by experience: luckily, if your first sheet doesn't turn out you can re-mix the batch, adding a drop more water if it's too dry and breakable or a spoonful more flour if it's too wet and sticky, and letting it rest again. It's not like pie dough: you can't ruin it by handling it! Let the sheets dry a bit on a floured cloth before putting them through the cutter; they will stick less that way. If the room is too warm, cool the dough before cutting it. Coat the noodles with lots of flour or corn starch to prevent them from sticking. Shake off the excess before plunging into boiling water. COOKING THE PASTA. Even though many recipes say that fresh pasta only requires seconds to cook, I find that it needs the same amount of time as regular pasta from the store – i.e., about 15 minutes. I'm probably doing something wrong, but I've been doing the same wrong thing with the same great results for about thirty years! GET THIS BOOK if you're serious about fresh pasta and noodles – and other authentic Italian home cooking. The fresh pasta chapter has 34 recipes! Molto Italiano: 327 Simple Italian Recipes to Cook at Home (by Mario Batali) is one of my favourites cookbooks of all time – and if you go by the customer reviews, I'm not the only fan. DURUM SEMOLINA. Durum semolina (and Durum flour) come from a special variety of high-protein wheat by that name; it's mostly grown in Canada. Durum flour is just finely ground semolina. I use Durum semolina for all my pastas. They taste better and don't fall apart. I buy it at the bulk store, but it's usually available at health food stores and gourmet grocery stores. I prefer the semolina over the flour because it keeps a little longer, but basically they're interchangeable. Both are sometimes called for in other Italian recipes, such as pizza and bread. Once you start stocking it you'll be looking for other ways of using it because you will love the distinct flavour it imparts! In Italy, all pastas are made from 100% Durum semolina – just read any imported pasta label. Semolina is more expensive than regular wheat flour: I have found that adding all-purpose flour in the proportion indicated in this recipe retains the quality while keeping down the cost. If you use Durum flour instead of semolina, you may need to adjust the liquid. Durum semolina and Durum flour should be kept in the refrigerator, as they tend to go rancid otherwise. I asked my local bakery if they could hook me up with semolina. They typically only use durum flour in their breads (a finer grind of the grain) but ordered for me anyway. I am now the owner of a 50# bag of semolina, honestly WAY more than i needed, but it only cost me 15USD. Andy, be sure to keep your semolina in a cool place because it does go rancid eventually. On the other hand, you could just use it up quickly -- there are other recipes using Durum semolina: some pizzas and breads, for instance. I was curious about your comments on semolina going rancid. I've just never had a problem with it doing that. I always store my bulk grains in a cool dry place, so i've never noticed a change in texture, favor, or consistency of the semolina. But perhaps i don't know what to look for, is there a certain quality to rancid semolina? Then again, i realize i have an exorbitant amount of pastas and semolina breads to make as this flour, though stored in an air-tight bucket, should not last me very long or it will be too old. It seems some people can detect the smell of rancidity more easily than others. I am extremely sensitive to that smell. Have you never had rancid butter? Ewww! Now I keep my semolina in the refrigerator or the freezer. A cool, dry place should work. Just always smell it before you use it. **New England Cheesemaking Supply Co.
Can You Make Danish Rye Bread in The Maritimes? What IS Boeuf Bourguignon, Anyway? My name is Gina. I was born in Montreal, into a family of great cooks and food lovers. I have owned and cooked in four French restaurants: one in Montreal, two in London (Ontario) and one in San Miguel de Allende (Mexico). My other interests include permaculture and learning new abilities such as watercolour, bookbinding and Italian.